Alas, here are my contributions to this year's Crazy 4 Cult art show. I'll be blabbing about them soon. at the bottom of this post. UPDATE: Hey, these were chosen to be made into a set of prints! I'll announce it here when they're ready to order, or you can keep your eye on www.stuff88.com or crazy4cult.com for details. UPDATE #2: Rather than tastefully allowing this art to speak for itself I've opted to prattle on about the creative process behind these, starting....now. My wife was my muse for the concept. 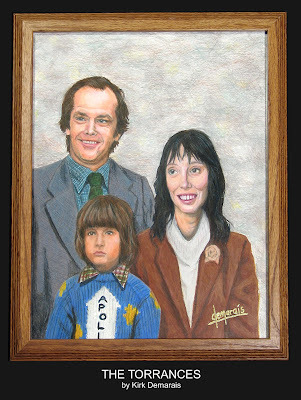 As I pondered aloud potential Crazy 4 Cult ideas she reminded me of an awesome old family portrait we'd recently seen for sale and I immediately connected the dots between cult films and the family portrait format. I'd already been thinking in terms of Fargo since I love the flick and it seemed underrepresented in last year's show, so I first envisioned William H. Macey's dopey grin in front of a Sears-style backdrop, and the thought delighted me. Moments later when the mental image of The Shining's Torrance family hit my brain, I grew extremely excited and knew I had to try to bring it to life. The family portrait format felt perfect since this type of photography is basically a study in pure affectation. And what's great about them is that the veneer of smiles is always too transparent to disguise the strain, the physical discomfort, the uneasiness, and often the volatile emotions bubbling beneath. Amazing how we don our most painful clothes and stand under all-illuminating heat lamps in a vain attempt to appear natural, happy, and "at our best." Then we send this piece of fiction to everyone we know. I vividly recall the agony of being forced to rest my hand on my sister's shoulder for literally minutes at a time! So when you drop these familiar movie families into the equation you've got a double layer of irony. Anyone who's seen these films gets flashes of the horrors each tribe is destined for. I also liked the idea of creating would-be movie props that could be at home in the families' respective fictional dwellings. I took dozens of different screen grabs from scenes throughout the film. I soon realized that I'd need to create head/body composites in some cases since the right head and the right body didn't usually share the screen. So I took my best screen captures and digitally cut them up and pasted them into family portrait-ish compositions (following examples of vintage Olan Mills photos via flickr.) I printed these out and using an old grade school grid technique (you draw a grid on the source material and another on the blank paper and use it as a general placement guide) I transferred and scaled my printout onto the larger 10 x 14 page. My first thought was to try to create these with acrylic paint, but at some point I remembered a colored pencil piece I did in college of Jeffrey Katzenberg, and I liked the effect. I could have made it easier on myself by tracing, but I chose not to; I wanted to allow more of myself to show through, for better or for worse, and I actually like the semi-primitive look and cartoonishness that naturally emerged. The final outcome is a nice mixture of artistic choices and pure inexperience. I tried to vary the styles somewhat from piece to piece based on each film and family. For instance, I figured the Torrances' photo would come from a K-Mart type store so it's slightly misframed and the lighting is severe in an attempt to match Kubrick's. In contrast, National Lampoon's Vacation was shot using very direct and saturated lighting, so when it translated into my colored pencils it made the piece feel flat and really cartoony from the very beginning. Since this look seemed to match the characters I decided not to fight it and I let the kitsch flow. I also carefully considered the frames for each, trying to match the eras and families' income. 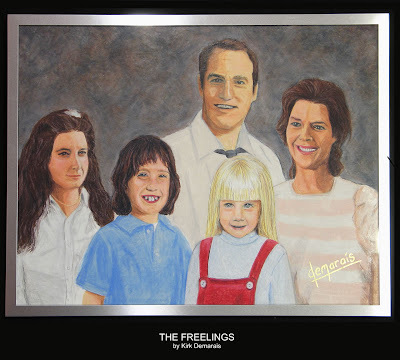 For example, the Freelings from Poltergeist seemed like they might have a more glamorous silver frame in their large suburban Californian home of the '80s, while the Lundegaards seemed a good fit with the dark wood. 1. The films they come from are all among my favorites. 2. They're all-American and "traditional" in that both parents are together (Well, at the time of the photo). 3. They all go though purely hellish experiences. 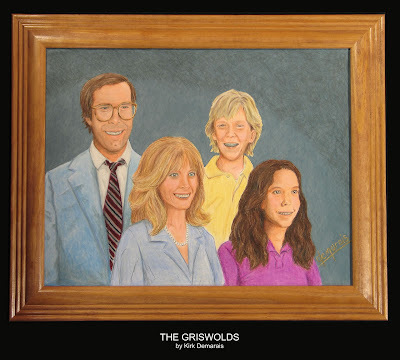 The Griswolds seemed out of place to me until I realized that I'd rather survive a vicious haunting with Steve Freeling (Craig T. Nelson) than travel cross country to Wally World under Clark W. Griswold's supervision. All in all, it's been great to take a break from the mouse pad to illustrate traditionally again. And being a part of Crazy 4 Cult was a purely wonderful experience. (I'll post my recap of the show soon.) Anyway, I hope you got a kick, a laugh, or a nightmare out of my art. These are awesome Kirk. I love the fact that you didn't feel the need to add a bunch of references to the flicks these families came from, they're just great family portraits. Congrats on being in the CFC show, you've had a busy year huh? Delightfully creepy, Kirk. With Prismacolors, you can skim the page or go waxy. 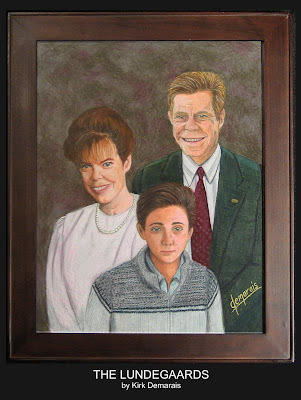 These are wonderfully (and appropriately) waxy, and the Olan Mills-esque signature is the icing on the cake. The oldest Freeling daughter earns the Biggest Whiner of the Lot Award, seeing as how she misses most of the horribleness, and yet reacts the hammiest when she gets out of the car. I can hear the theme from Family Ties playing in the background as I gaze at these beauties! Those are great, Kirk. Nice subject choices as well. How much for a print of the Torrance or Griswold Families? Thanks Shawn! Yeah, I think there's something satisfying when you have to take a moment to mentally connect the dots vs. it being spelled out for you. I have indeed been very blessed this year. thanks savage, and thanks for making me feel at home at the show! It was great to see you. Thanks Travis! Glad you got the reference too. I lol'd at your mention of the Poltergeist sister. She was so worthless. Some people see it the piece and say "There was a teenage sister?" I can barely understand why she was even in the movie. todd- ha, ha thanks. The Family Ties opening actually came to mind at least once every time I worked on these. I should have cued up the theme on my itunes. thanks Rozum- as I chose the families it made me realize how many great movies were made between '80 and '82 in particular. when they're available. I have no idea how long it will take before they're ready. Thanks for your interest! Great work, Kirk D. The liner notes add something wonderful too. Now, in the last post someone mentioned a potential missing member in the Torrances painting. Every time I see it now, I expect the old, saggy-breasted witchy woman to sidle in next to Wendy. Creepy! I'm so glad I took the time to read your 'prattle' because at first glance, I was like, what??? But after reading the blog I'm like AWESOME! Congrats on these brilliant pieces. I would love to have a print myself, of 'The Lundegaards.' I love the lapel pin. Is this supposed to be some kind of sales achievement pin maybe awarded at a sales rally? Love it! I especially like the Olan Mills-style signature! Great! I noticed Wil Wheaton gave you a mention on his blog! You might even consider a Velvet Elvis approach for some of your pieces. I love the unsettling familiarity of these works. All of these are extremely well done. My favorite is "The Shining" because it's so creepy! wow ! these are great ! The name is 3 friends. I love read your post, i will share my history too..
kirk, these are absolutely amazing. i think the torrances are definitely my favorite. They're all good but the Griswolds are my personal favorite! That's some of the most awesome stuff I've ever seen! This is one entertaining blog btw. Love the place. Keep up the good work!! Respect, these are some good family portraits. I especially like Jack Nicholson, he looks great. So fun that these have gotten a second life on the web. chris- aw, you had to bring that up. I'd like to see that lady walking through K-Mart to the portrait studio too. gene- thanks so much and great to hear from you. Your perception is so keen on the lapel pin! Yes, I had to dig online and I found ONE source that quoted the Cohens as saying it was indeed a service award of some kind. I love that detail of his character. jody- glad you noticed the signature. And yes, Wheaton is my new best friend. tomstoyz- thanks, happy to creep you out! voncheech- I've got a list of others I'd like to do. Part of me wants to get busy on them and part of me wants to experiment with something else. 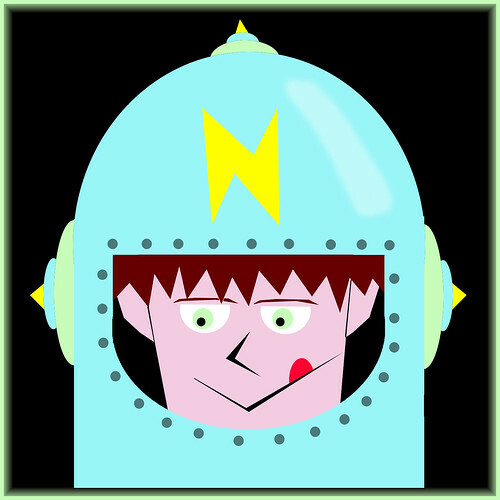 micgar- hey, thanks for alerting me. I've been to his site quite a few times, but I was unaware. Cool. Thank you too anthony, I'm in agreement with you. mick o'brien- Welcome! So glad you're enjoying it. Thanks for the encouragement. jana thejunction- Jack was the toughest one, so I'm glad the effort paid off. Thanks! Hi Kirk, If I had to pick a favorite, I'd go for the Torrances. Have you considered a master work with ALL of them in a family picnic shot or something? burt- ha,I'm still pondering future cult inspired work, but something like that would be funny. What a picnic that would be. Nice post. These paintings are really delightful. I love these paintings. how about the corleones, tenenbaums?